Poppies House is a beautiful, completely renovated 3 bedroom house, perfectly situated in the heart of Glenorchy. This lovely house is presented to the highest standard and will please the most discerning guests. 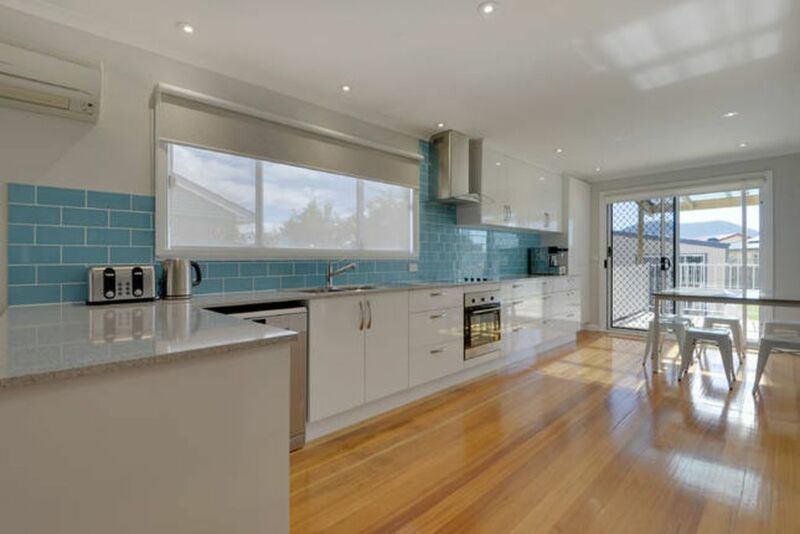 Central to the house is a large, stylish, well equipped kitchen featuring stone bench tops, coffee machine, dishwasher, microwave and large fridge with ice / filtered water. The pantry is stocked with essentials and a complimentary starter pack on arrival. The laundry has a washing machine and dryer, iron and ironing board. Adjoining the kitchen there is a stone top dining table with seating for 6, and a beautifully equipped lounge with luxurious leather lounges , 65 inch smart tv with dvd selection, wii console and games. The kitchen opens out onto a spacious deck with alfresco dining, bbq facilities, large secure backyard with basketball hoop. A games room is also offered with table tennis, arcade games and additional lounge and tv. Poppies House offers 3 bedrooms. Bedrooms 1 and 2 have queen beds, smart tv, wardrobe,electric blanket, bedside lamps and clock radio. Bedroom 3 has 2 single beds, wardrobe, electric blanket, bedside lamp and clock radio. The second bathroom has a large shower, hand basin,toilet and hairdryer. All linen and towels are supplied and are commercially laundered. Washing machine and dryer great!! A wonderful fresh comfortable home. Very clean and tidy place. Comfortable beds and all that you need in a home. Lovely bathrooms too. Close to all that we needed. Wifi works very well. Thank you Mark and Miriam for our stay. A very comfortable property within easy reach of all Hobarts attractions. We had a lovely stay at this property. It is a very comfortable house and within easy reach of everywhere we wanted to go. I had noticed lots of reviews stating the welcome pack was enjoyed, however we were dissapointed with this (maybe we've been spoilt at other properties) but had to go to the shops after arriving late to get milk and bread. As I said we were very comfortable but I do feel its a little over priced. A modern house with all mod cons. The house was great: multiple televisions, Wi-Fi and the games room were particularly welcome for the boys. The washing machine was very welcome after a week without one! Poppies House was a great place to stay. Massive kitchen with everything you could possibly want, with extras like cooking oil, gladwrap/foil, cereal, biscuits etc. Two of the bedrooms have smart TV's, with a massive TV (also smart) in the lounge room, meaning we had access to our Netflix account. The games room out the back was a big hit with the kids, as was the ample sized yard for scooters or a kick around. All in all, a very comfortable place to stay.